Overlooking a picturesque valley with a panoramic view of seven mountains, Club Med Grand Massif Samoëns Morillon is one of the most hotly anticipated new ski resorts of the Alps. With excellent facilities for families, groups and couples, this modern cliff-edge accommodation is part of an architectural vision that places a cutting edge resort subtly and seamlessly into its naturally beautiful surroundings. 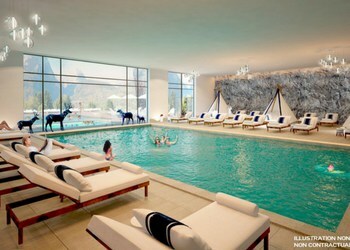 When was the last time you stayed at a Club Med ski resort? If you’ve stayed at a Club Med resort once, then the chances are you’re planning another stay soon, or you’ve visited many of them. Club Med customers are loyal to the brand and with good reason; Club Med offers real luxury and value for money, as well as extraordinary children’s facilities. The après ski activities are various and entertaining, while the tuition, customer service and cuisine are all of an extremely high quality. Today, we’ve got very exciting news for you. The brand new Club Med Grand Massif Samoëns Morillon resort is now open for business. It might be time to book yourself in for an exciting Alpine adventure. Let’s have a look at what this resort offers. Grand Massif is a snow-sure area in the Giffre Valley of the Alps, just over an hour away from Geneva. With 265km of pistes and 140 different pistes designed to suit all levels of skiers, from complete novices to intermediates and seasoned professionals, you’ll not only find a run that’s exhilarating right now, but also runs that will still excite you by the end of your holiday. From the nursery slopes, you’ll progress to the blue, green, red and black runs, as well as the freestyle areas. For something that’s a little bit different, why not take the time to explore the Piste des Cascades, which is a 14km run that will take you through the picturesque Alpine forest. You can get into the skiing area at an altitude of 1600m from the heart of the unspoilt village in just 8 minutes, thanks to the express lift. In 9 minutes you can climb a further 520 metres. The lifts in this area are a huge advantage, as there are so many of them. The 80 individual lifts, many of them fast, mean that there are relatively short lift queues compared to some other resorts. As well as skiing and snowboarding, there’s plenty to entertain you in Grand Massif. Why not book yourself on a thrilling snow scooter ride, or take the time to visit the hauntingly beautiful icefalls. Viewing the mountainside via helicopter is always a lot of fun too and when you tire of the village facilities, you can simple go back to your Club Med Samoëns Morillon resort and enjoy the facilities there. This ski in / ski out Club Med resort is located at 1600m on the Plateau des Sais and designed with architectural innovations that allow it to blend harmoniously with the surrounding natural beauty. 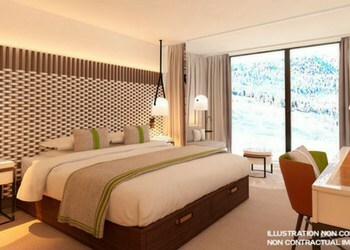 As with all Club Med accommodation, you’ll have a choice of room size. The standard club rooms are spacious and contain everything you’ll need to add convenience to your stay; such as a television, a safe and a hairdryer. If you’re travelling with your kids or a group of friends, you might prefer the extra space provided by the deluxe rooms, or even the generous square metres of a suite. As Club Med packages are all-inclusive you’ll be well fed and fed well. Meals prepared using fresh ingredients are created on site by a Michelin star-winning chef; Eduardo Loubet in the Gourmet Lounge Restaurant. It’s worth setting aside at least one evening to indulge in the taster menu and get a sense of the chef’s full potential of signature dishes, with wine pairing. The family restaurant is more suitable if you’re eating with the kids. Here you’ll find a range of international and regional dishes. The kids will especially enjoy the children’s lunch service here, which is aimed at your little ones. Once you’ve eaten your fill of an evening and you’d like to enjoy a relaxing drink, why not head over to the Main Bar. Here you’ll find a friendly, welcoming atmosphere, which is alternately relaxing or lively, depending on the time of night. Children at Club Med are celebrated, rather than frowned upon for making noise or running around. There are dedicated kids’ clubs for a number of different age groups and of course your children will be encouraged to make the most of the snowy terrain. The childcare professionals employed by Club Med Grand Massif Samoëns Morillon are all heavily qualified and experienced nannies. Very little ones will be helped to uncover the potential of their motor skills and go for walks, as well as enjoy crafts, being creative and stories. A range of games will be played to stimulate the kids’ creativity and developing dexterity. Meals will be eaten in the company of the other children, overlooked by their carers, unless you’d prefer to take them for their lunch and tea. As the childminders understand the importance of taking a nap during the day for some children, special nap areas will be prepared. Your child will be in a safe environment, that is fun and enjoyable. Those who are little older; around 2-3 years old will also enjoy being creative, games and music, but in addition sport will be added to their schedule. From the age of 3 they can take part in Club Med’s innovative “Learning to ski and the pleasure of snow course” in the resort’s own snow garden. This is a course that takes place for 3 hours a day, for 5 days a week, which teaches the children how to ski on a circuit, under hoops and around obstacles. The ski equipment in the garden includes a ski tow and a snow belt. When your kids are 4, up until the age of 10, they’re old enough to have a ski instructor and can begin to learn skiing in earnest. They’re not hurried or pressured to improve their skills, but rather encouraged to develop their technique at their own pace. As well as skiing, there will also be plenty of other activities to entertain them, such as art and crafts, dancing and games. Kids of this age will also have the opportunity to eat lunch and dinner with their friends in the club should they wish. Teenagers also love Club Med. 11-17 years old are encouraged take part in skiing or snowboarding classes, as well as take part in other activities at this age group, The cinema nights and discos are very popular. Your biggest problem with bringing children on a Club Med skiing holiday is that they’ll be so busy, you’ll hardly see them and when you do, they’re likely to be whizzing down the slope stylishly, making skiing look a lot easier than it feels to you! If you love skiing holidays and you love Club Med then there’s every reason to try out their new resort Club Med Grand Massif Samoëns Morillon resort. It’s surrounded by beautiful hamlets in a virtually untouched area of the French Alps, but only an hour away from the bright lights of Geneva. You’ll dine well here and drink fine wine, as well as make full use of the facilities. Whether you love having a cardio session to get yourself into shape for the next day’s skiing, lifting weights, or taking a pilates class, you’ll have a lot of leisure choices. Just swimming in the pool with your family as you take in the panoramic view of the seven mountains around you can feel pretty blissful and we can help make this Alpine dream a reality. Here at Aspen Travel we are trusted booking partners for the Club Med All Inclusive. We know exactly what is included in each of their packages and can advise you on the available facilities at each Club Med resort. If you’ve got a question about the sort of lift pass you need to have, what first-time skiers ought to pack and what to expect on your first day on the slopes, we’ll be able to help. Please give one of our friendly team members a call and ask any questions you may have, then we’ll be able to begin the booking process for you, making it as simple as possible. No one else provides family skiing holidays quite like Club Med’s, but don’t take our word for it. Come and see for yourself. Come to Club Med Grand Massif Samoëns Morillon!